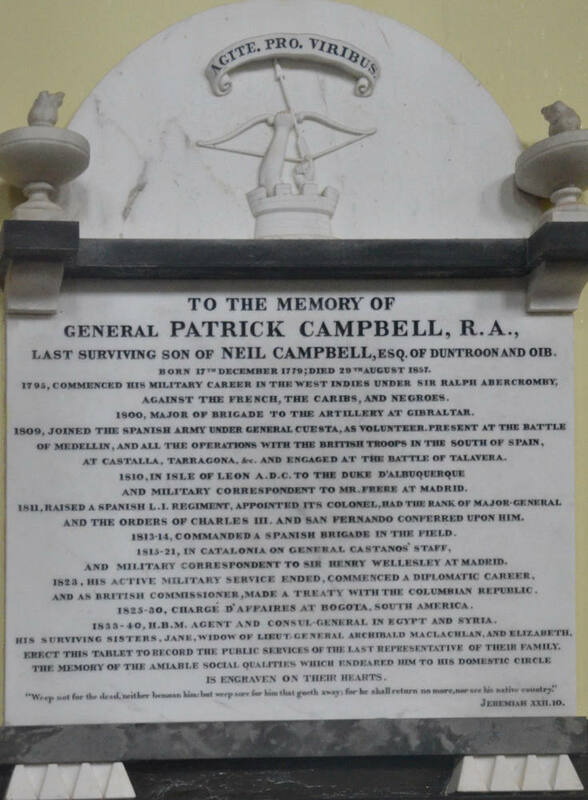 Memorial for General Patrick Campbell, R.A.
To the Memory of General PATRICK CAMPBELL, R.A., the last surviving son of NEIL CAMPBELL, Esq, of DUNTROON and OIB. 1795, commenced his military career in the West Indies under Sir Ralph Abercromby, against the French, the Caribs, and Negroes. 1800, Major of Brigade to the artillery at Gibraltar. 1809, joined the Spanish army under General Cuesta, as volunteer, present at the battle of Medellin, and all the operations with the British troops in the south of Spain, at Castalla, Tarragona, &c. and engaged at the battle of Talavera. 1810, in the Isle of Leon A.D.C. to the Duke of Albuquerque and military correspondent to Mr. Frere at Madrid. 1811, raised a Spanish L[ight]. I[nfantry]., appointed its Colonel, had the rank of Major-General and the orders of Charles III. and San Fernando conferred upon him. 1813-14. Commanded a Spanish brigade in the field. 1815-21, in Catalonia on General Castano’s staff, and military correspondent to Sir Henry Wellesley at Madrid. 1823, his active military service ended, commenced a diplomatic career, and as British Commissioner, made a treaty with the Columbian Republic. 1825-30, Chargé d'Affaires at Bogota, South America. His surviving sisters, Jane, widow of Lieut-General Archibald Maclachlan, and Elizabeth, erect this tablet to record the public services of the last representative of their family. The memory of the amiable social qualities which endeared him to his domestic circle is engraved on their hearts. “Weep not for the dead, neither bemoan him; but weep for him that goeth away; for he shall return no more, nor see his native country.” — Jeremiah XXII.10.